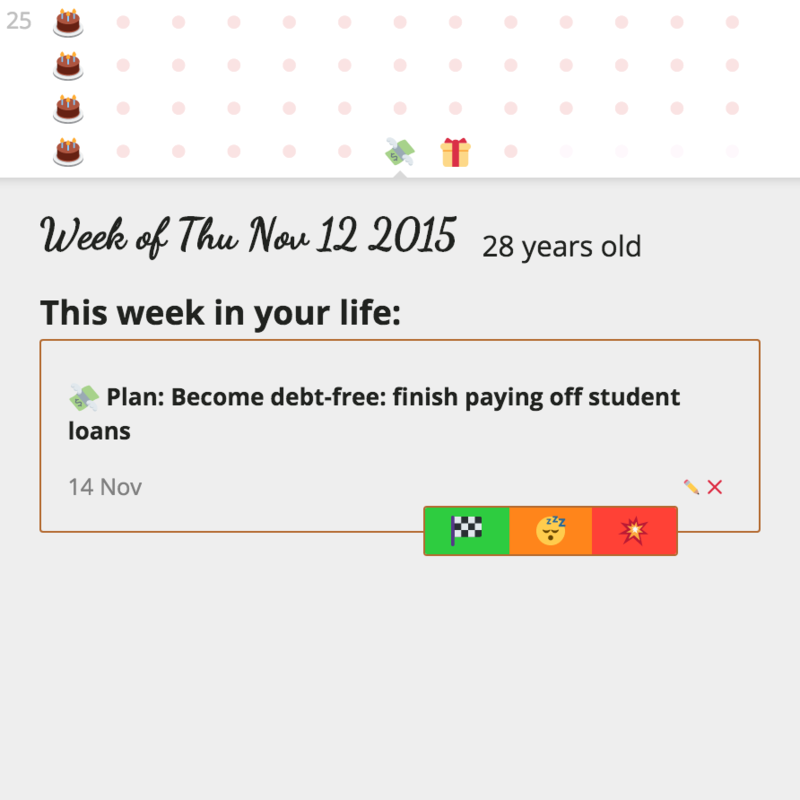 An intentional living app that shows you a zoomed-out view of your whole life in weeks, to help you chart storylines and create meaning. It's easy to get stuck in the monotonous slog of the present. It's easy to lose awareness, and to let each week slip by without thought. It's easy to stop being intentional about how we live our lives. Most likely, all the other websites and apps that you use today will only increase your tendency to lose context. They'll keep you focused on a view of the branches right around you. Entire.Life will lift you above it all, and show you a view of the whole forest. The whole, beautiful forest of your life. When were you born? This will be the first date on your chart. Your life tells a story. Use Entire.Life to track the plot twists that have lead to where you are. 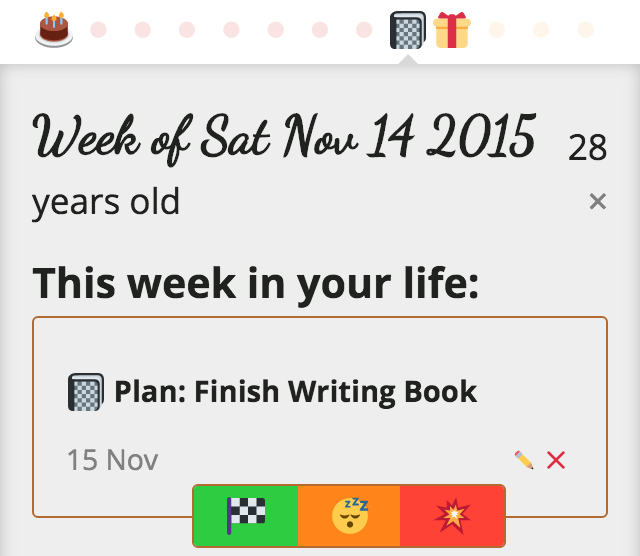 You can add as little or as much detail as you want—even using Entire.Life as a journal! 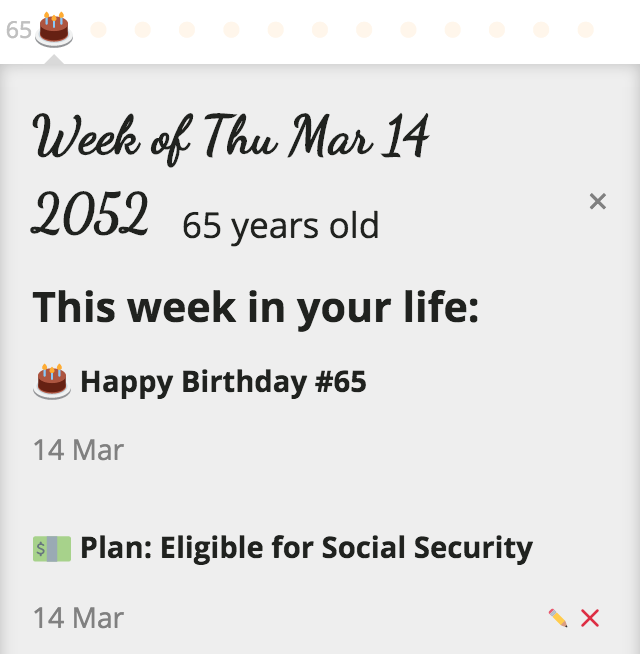 Add plans for next week, next year, or even your hundredth birthday! Once the date of a plan has passed by, you can mark it as completed, snooze it until next week, or just forget all about it. If you had a diamond for each week of your life, the whole lot of them would fill one spoonful. Entire.Life helps keep you in a zoomed-out view of your life. It's natural to feel some angst about that at first, but once we get past our fear of being tiny, seeing our diamonds for how vanishing and finite they are can help to motivate and free us. That's because, no matter how awesome our lives look from far away, our actual day-in, day-out activities can often seem like a monotonous slog. Entire.Life doesn't just give you the present. It also gives you your entire past, back to the day you were born. 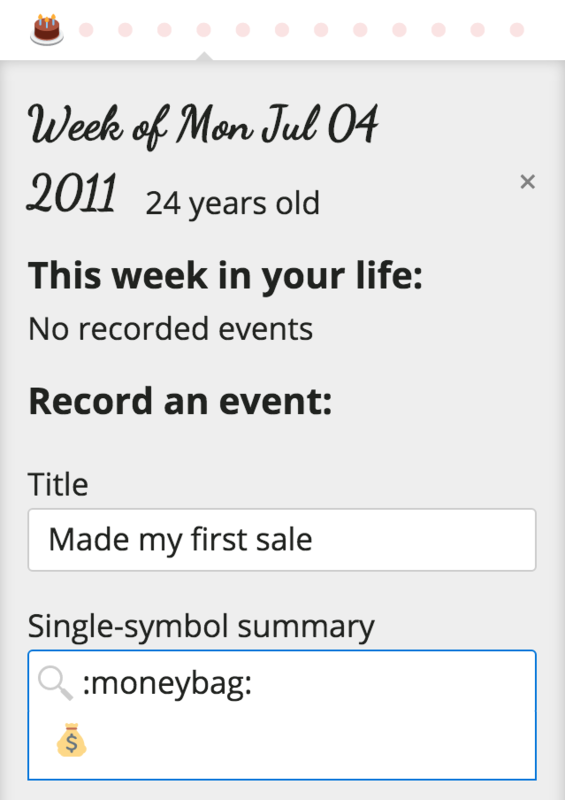 And instead of just adding thoughts and events about the present, you can add events for any of your past weeks. With all of that historic context, the present can start to feel like a gift again. We can remember how hard we worked to get where we're at, and spot plot arcs and foreshadowing that give us a sense of purpose. Entire.Life also shows your whole unwritten future. 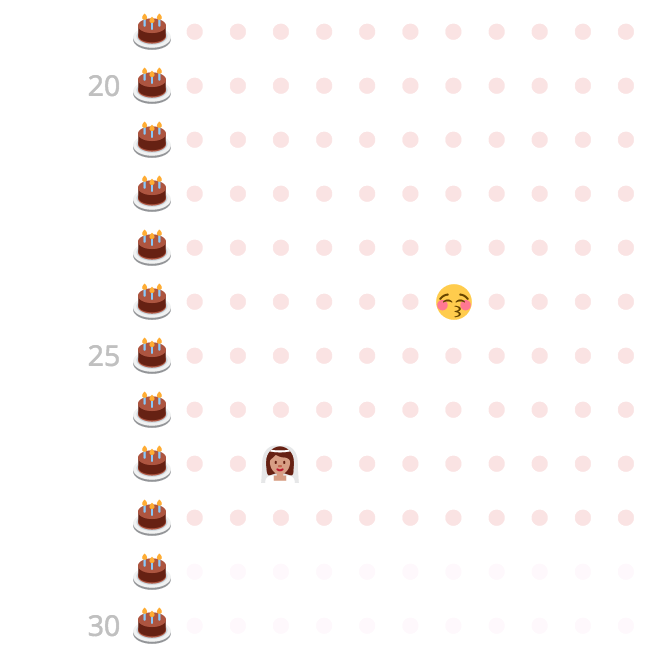 You can add plans to any future date. Once the date passes by, you can mark it as complete, snooze until next week, or forget about it forever. But you can even add farther-future events. Just as reflecting on the past can give us a sense of gratitude, reflecting on the future can give us a sense of urgency.